Visit the Arctic home of Santa Claus with a Lapland holiday and experience the thrill of reindeer sleigh rides and snowmobiling against the backdrop of a magical snowscape. Iglu Ski offers a wide selection of Lapland holidays to a variety of resorts including the well-loved villages of Levi, Yllas, Saariselka and Rovaniemi. Enjoy a wide selection of activities on your holiday, from husky sledding and reindeer sleigh rides to visiting Santa. What can you do on a Lapland festive holiday? Winter sports: Experience snowmobiling, husky sled rides, reindeer sleigh rides and much more. Quality time with the family: Make memories that will last a lifetime on this truly unique adventure. Lapland holidays come in all shapes and sizes. The most popular packages are 3 and 4 day trips but Iglu Ski also offers day trips and 5 day breaks to Lapland during December. Alternatively view 7 night ski holidays to Lapland throughout the ski season. 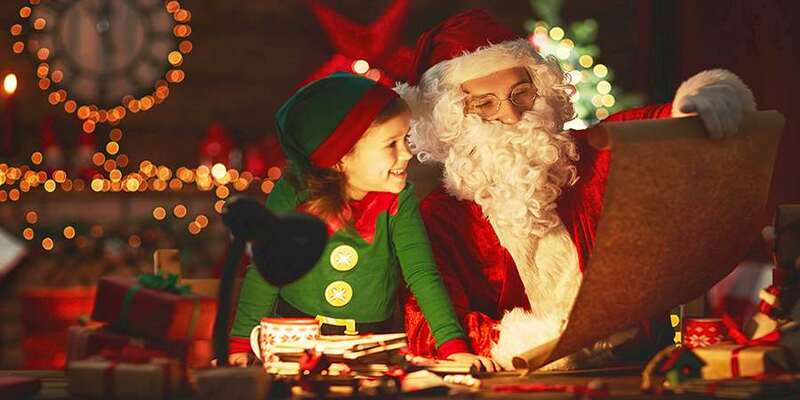 There is a whole wealth of activities for the whole family to enjoy and there are Lapland holidays to suit people of all ages and all budgets. 3 and 4 day trips for December 2019 are now on sale. Browse through our different Lapland holidays below; you are sure to find the perfect fun packed Lapland trip to suit you and your family. Experience a one day tour to mystical Lapland. Enjoy an exciting sleigh transfer from Enontekio airport to a beautiful location in the Lappish countryside before visiting a snow igloo and participating in a variety of traditional arctic activities. A trip to Lapland wouldn’t be complete without meeting Father Christmas! In the afternoon a snowmobile and sleigh will transport you to Santa’s home in the forest and each child will receive a gift from Santa. Thermal snow suits, boots, breakfast, lunch and dinner is provided. Escape the hustle and bustle of the modern world & be transported to a land full of mystery and magic in search of Santa. Prepare to be spellbound by the beauty of Luosto, as you feel at one with nature, set amidst the Lappish wilderness. Meet Wendy Wood, the toymaker & a host of special friends as you search for Santa. Feel the power of the paw, as the huskies whisk you away through ancient snow covered forests in our quest to find the great man. Events and activities include a welcome dinner, Santa’s Post Office, Meet the Elves at home, reindeer and husky rides, snowmobile and sleigh rides, Snow games with Santa’s Special Elves, tobogganing, private meeting with Santa and a festive farewell dinner. Enjoy a magical 4 day winter adventure holiday to Pyha, a pretty village, set in stunning scenery deep in the Lappish Fells. Search for the great man in his secret hideaway with the help of Santa’s Special Elves. Events and activities include: Santa’s Post Office, Meet the Elves at home, reindeer and husky rides, snowmobile and sleigh rides, Snow games with Santa’s Special Elves, tobogganing, private meeting with Santa and a festive farewell dinner. Merging fantasy with reality, enjoy a magical Christmas in a picture post card setting. Fir trees laden with crisp white snow, tireless husky dogs excitedly tugging at sleighs & snowmobiles speeding their way across icy tracks, all wait you as we push the boundaries of your imagination for your Christmas holiday of a lifetime. The Special Elves will be there to lead us in our search for Santa and the resilient reindeer will help to guide the way. Visit the land of dream and create a lifetime of precious memories. Celebrate the New Year in style and wake up to the first day of 2018 in the unforgettable setting of the Arctic Circle. Based in Luosto you will enjoy a holiday full of challenging snow-based activities during your week in Lapland, including viewing the Northern Lights (weather permitting). This itinerary is popular with adults but also suitable for children over 5. Activities included in the tour are: Amethyst mine tour, guided snow shoe hike, 4-5 hour snowmobile safari, reindeer sleigh ride, husky safari and a special New Year’s Eve dinner held at Kelo Log Cabin restaurant and after party at The Merry Elf.